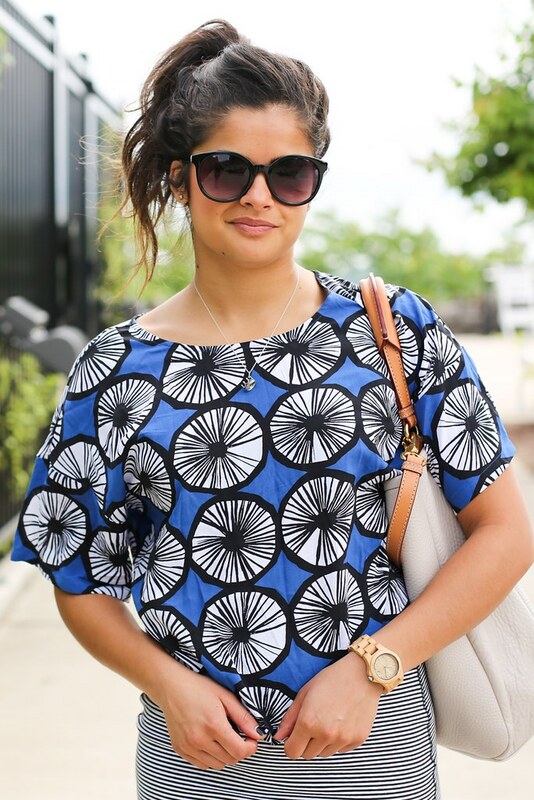 South Beach | Priya the Blog | life & style in Nashville & beyond! I picked up a whole lot of the Marimekko for Target collaboration (placemats! A swimsuit cover-up! Salad plates! My friend just gifted me a beach towel!) but this Appelsiini top is by far my favorite. Paired with black jeans & strappy heels, it's become a go-to for a night out of drinks with friends. I wanted to make it a little more classically "work-friendly", so I paired it with a fitted pencil skirt (that's a bit too fitted, and for sale in my Poshmark closet right now) and my beloved clogs. I loved the way this turned out! The boxy top + fitted skirt silhouette is perfect. And seriously, I can't say how much I love this top. The combo of the fun Summer-y print and flattering fit (boxy, comfortable after eating whatever you want, but STILL flattering) is a winnah! - And when I get back in Nashville, it will be Talent Week/Talent Night at work! And that is how I'm laughing instead of crying today. Did this just turn into a Thankful Thursday? I think so! What's coming up in your life that you're looking forward to? Share with me so I can be excited with you! Okay confession, I hated that line when it came out because I think it was just too much for me.... buttttt I now love it on you! That top is just absolutely darling! That watch looks amazing on you. We are always keen to work with bloggers just like you. IU have created a full review of JORD and other watch companies. Let me know if you would like to write a guest post. For the full review please go to https://woodmafia.com.au/updates/best-wood-watches/ I look forward to working with you!